Driver cited following Polk Road crash. HART – An 81-year-old Hesperia woman was cited by the Hart Police Department for failure to yield Monday, April 8, at 1:30 p.m. following a vehicle crash causing injuries on Polk Road by the US 31 Expressway, according to Hart Police Chief Juan Salazar. – 2 p.m., family trouble, 400 block of Griswold Street, City of Hart. – 5:43 p.m., larceny, 200 block of State Street, City of Hart. – 7:02 p.m., alarm, 100 block of State Street, City of Hart. – 8:42 p.m., a 22-year-old Shelby man was arrested for operating without a license, Washington and Hart streets, City of Hart. He was lodged in the Oceana County Jail. – 10:15 a.m., reckless driving, Polk Road and Comfort Drive, City of Hart. – 6 p.m., family trouble, 100 block of West Main Street, City of Hart. – 10:38 p.m., a 41-year-old Hart woman was arrested on an outstanding warrant issued by HPD, 400 block of Wood Street, City of Hart. She was lodged in the Oceana County Jail. – 2 p.m., unwanted person/trespassing, Peach Street, City of Hart. – 10:11 p.m., suspicious situation, 300 block of Peach Street, City of Hart. – 11:18 p.m., a 52-year-old Hart man was arrested for operating without insurance, and a 46-year-old Hart woman was arrested on an outstanding warrant issued by the Oceana County Sheriff’s Office, Jefferson and State streets, City of Hart. They were both lodged in the Oceana County Jail. – 1:10 p.m., suspicious situation, East Main and Hart streets, City of Hart. – 3:39 p.m., domestic assault, 800 block of Dryden Street, City of Hart. 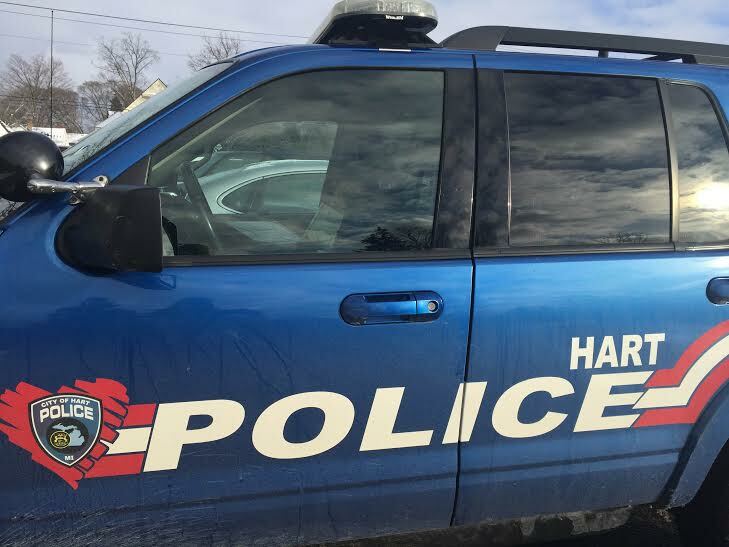 – 4:30 p.m., a 29-year-old Manistee man was arrested for driving while license suspended, State and Wigton streets, City of Hart. He was lodged in the Oceana County Jail. – 6:15 p.m., larceny, 20 block of State Street, City of Hart. – 9:30 a.m., larceny, 400 block of Wood Street, City of Hart. – 7:20 p.m., disorderly conduct, 200 block of Riverside Drive, City of Hart. – 12:45 p.m., medical assist, 300 block of Johnson Street, City of Hart. – 3:50 p.m., a 29-year-old Mears man was arrested for probation violation, Oceana County Probation and Parole Office, City of Hart. He was lodged in the Oceana County Jail. – 9:46 a.m., fraud complaint, Johnson Street, City of Hart. – 2:16 p.m., medical assist, 700 block of East Main Street, City of Hart. – 6:45 p.m., medical assist, 600 block of East Main Street, City of Hart. – 7:57 p.m., a 29-year-old Hart man was arrested on an outstanding warrant issued by HPD, 100 block of Wood Street, City of Hart. He was lodged in the Oceana County Jail. – 9:11 p.m., unwanted person, 300 block of East Main Street, City of Hart.